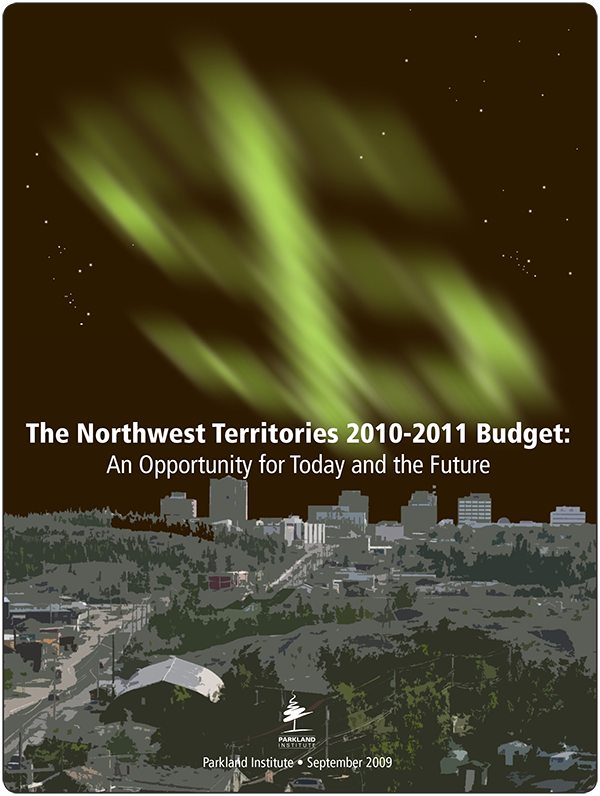 The budgets of the Government of the Northwest Territories (GNWT, Government) have attracted significant public attention in the last two years, largely because of significant spending and jobs cuts the Government announced in early 2008 which were partially revoked due to public opposition. More recently, budget attention has been due to the global economic recession that has driven governments across the nation and around the world to engage in significant stimulus spending. In this context, this report provides an analysis of the recent budget, the current economic situation and the risks and opportunities the Government faces in its upcoming 2010-2011 budget. The Government has recognized the seriousness of the recession, calling it an "unprecedented economic turmoil" that is "likely to last into 2010 and possibly longer." It also has noted the need to address the long-term and other concerns of NWT residents: quality of life; education; employment; health care; cost of living; climate change and the environment. Did the Government's 2009-2010 budget adequately address these concerns? In a nutshell, no; the budget was largely business-as-usual. Baseline revenue trends stayed on track. The government wisely avoided making tax reductions, which are an ineffective form of stimulus. And it did institute some positive tax changes, such as a property tax on resource extraction properties and increases in revenues from tobacco and liquor. However, the Government failed to take advantage of some revenue opportunities that would yield social, economic and environmental improvements in the NWT, e.g. a resource income tax, capital tax, hotel and airport taxes, commercial freight toll, fuel tax, carbon tax and a re-scaling of the personal income and payroll taxes to boost the incomes of middle and lower income residents and reduce revenue "leakage" outside of the NWT. The Government also continued to draw attention to the idea of resource management devolution as a solution to its financial woes. It likely won't be a solution though, as transfer of that taxation power would likely result in an equivalent reduction in federal cash transfers. On the spending side, the Government offered strong rhetoric acknowledging the importance of stimulus to maintain employment and economic activity. However, the actual budget numbers showed a failure to significantly increase spending over baseline trends. Fortunately federal politics intervened; the opposition parties forced stimulus spending on the federal government, which has since adopted it wholeheartedly. The federal economic stimulus spending program provided cost-shared programs resulting in a series of GNWT spending announcements and Supplementary Appropriations bills. Capital spending has thus been raised by 50 per cent to more than $300 million, and may go higher. The Government's bottom line and spending capacity are strong and getting stronger. For 2009-2010 it budgeted another operational surplus and it continues to pay down debt. It is one of very few jurisdictions in Canada to have net financial assets, joined only by Alberta and the Yukon. With an accumulated surplus of $959 million and more than $63 million in net financial assets, the NWT can conduct major stimulus spending without going into long-term net debt. The NWT economy and government finances are strong, but vulnerable due to a lack of diversification and heavy reliance on resource extraction, exports and construction. These sectors are expected to be hit hard by the recession. Economic experts do not agree on when the recession will end. One thing most commentators agree on is that the health of the global economy is precarious and reliant on public spending, and that the recession will be deeper and longer if that spending is withdrawn too soon. Aside from the risk of a second dip, there are a number of additional reasons for the GNWT to adopt stimulus spending. These include the normal time-lag for the job recovery, the need to give the right signals to the private sector, the inadequacy of the Federal stimulus program, the opportunity to build needed infrastructure at a discount and the weakness of automatic stabilizers like EI. In general, Government budgets tend to be focused on business needs and economic growth. Environmental and social sustainability, while often receiving rhetorical support, rarely see that support translated into serious policy. The government should adopt a social and environmental screen for reviewing budgets — as well as legislation and other major initiatives — and make the results of the screening and decision-making public. Although the largest part of GNWT revenue is federal transfers, it can control its own source revenues. An earlier report, the Fair Price report of the Parkland Institute, recommended an integrated package of tax reforms — as noted above — aimed at boosting the social, economic and environmental sustainability of the NWT. The Government did raise tobacco and alcohol revenues, which were a part of the Fair Price package. It should continue with phasing in the rest of that package over the next four years, which would capture about $54 million by year four. This would be broadly consistent with the Government's stated intention to raise an additional $40 million by 2009-2010 (which has been deferred during the recession). The Government should also be setting and meeting savings targets. Savings can help stabilize the government's fiscal capacity and the broader economy through the business cycle, and can help ensure the long-term sustainability of important public programs and services. The two main savings vehicles the GNWT should consider are an Economic Stabilization Fund and a long-term Territorial Trust Fund. When the economy is down, governments should increase spending in order to provide stimulus. And when the economy is booming, governments should save money to create a fund for stimulus spending, which also helps cool an overheated economy. Governments across Canada and around the world have demonstrated acceptance of countercyclical spending and have adopted stimulus spending packages during this recession. The GNWT should create an Economic Stabilization Fund. The savings rate should be adequate to provide for stimulus spending in recessions. Rough calculations suggest that savings on the order of $5 million to $10 million per year in growth years should be adequate. The Fund should be filled immediately, using borrowed funds and net financial resources accumulated during the most recent boom. It should be used immediately, during the current recession, to stimulate job creation. In the long term, non-renewable resource extraction will decline along with the economic activity it spurs. The Government should establish a Territorial Trust Fund, like those in Alaska and Norway, to gather economic rents from resource extraction via a new resource income tax, as noted above. Deposits should be inflation-proofed and protected from premature withdrawal. When the resources have declined and Government revenues are down, that Fund could begin to spend at a sustainable rate to preserve important public programs and services. A GNWT consultation reported business, NGO and local government agreement on such a fund, and the 2009-2010 Budget Address confirmed the government intended to work with members of the Legislative Assembly to pursue this measure. On the spending side, the government should, as a first step, abandon the remaining cuts first announced in 2008. Now, in this serious recession and its aftermath, is not the time to cut any spending or jobs. Second, the government should avoid privatization and so-called public-private partnerships (P3s). P3s create additional costs not faced by public projects (e.g. higher borrowing costs and the diversion of value to shareholders, corporate advertising and lobbying) while reducing transparency and accountability. The current proposal by ATCO to acquire the NWT Power Corporation should be rejected; NWTPC earns significant net revenues for residents of the NWT ($9 million last year) and has hefty retained earnings of $54 million. The government should boost its short-term stimulus spending. This spending should be aimed at smaller, shovel-ready projects rather than mega-projects that take a long time to get off the ground. The projects should be selected on the basis of how many jobs they would create; oil and gas extraction and pipeline transportation create relatively little employment per dollar spent. Finally, the spending should have a view to the long-term future, and rising fossil fuel energy costs. Retrofitting buildings for higher energy efficiency would address all of these points. The Government should expand the Energy Efficiency Incentive Program to cover the costs of energy efficiency retrofits to bring all public housing and all other public buildings up to a high standard of efficiency. The Program should also subsidize retrofits to other residences occupied by residents at low and middle income levels. The Government should complement this investment with a program of training and education. Such a program, while providing some stimulus itself, would prepare the workforce to supply skills needed in the future. The Government should also prepare to expand long-term baseline spending. Even setting aside $10 million per year for the Economic Stabilization Fund, the revenue changes discussed earlier would provide about $44 million per year in additional spending capacity in the long term. In terms of social sustainability, the Government should build up its own automatic economic stabilizers — progressive income taxes and income support systems. Such systems also help provide a countercyclical balance to the economy. The Government should adopt and fund a comprehensive poverty reduction strategy. It should also increase funding to early childcare education programs, extending those programs to pre-kindergarten levels. Doing so provides an investment in the future, and would cost on the order of $18 million per year. It should also assess current cultural and language programs in order to determine whether boosting their budgets could aid in preserving culture and languages. Finally, in order to boost environmental sustainability and mobility for seniors, youth and lower income people, the Government should expand funding for existing transit operations and assess the options for developing new routes within and between communities and other key destinations.